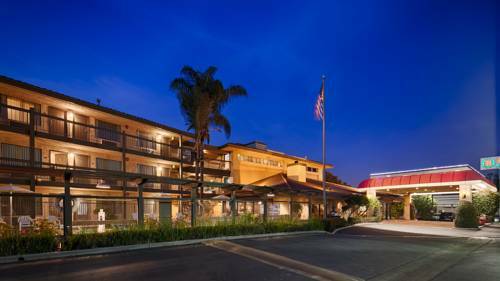 Welcome to this TripAdvisor Award Winning Best Western Plus Executive Inn located in Rowland Heights near Los Angeles and Orange County attractions such as Disneyland and Universal Studios. FREE Wi-Fi Internet, FREE American and Asian Breakfast, FREE Parking and discount LAX Shuttle make this an affordable and convenient location when visiting Southern California. The Mandarin and 99-Ranch Market shopping plazas next door feature more than 20 different international restaurants, shops, bank, grocery and tour desk. Business guests appreciate a variety of business services including a 24 hour business center, free T-1 Internet access; and courtesy shuttle to nearby corporate centers in Walnut, Diamond Bar, Pomona and City of Industry. Easy freeway access within half an hour of Disneyland�, Downtown Los Angeles, and beaches. Daily FREE shuttle to Citadel Outlet Mall. Close to California State Polytechnic University Pomona and Mount San Antonio College, the annual Rose Bowl Parade and Los Angeles and Anaheim Convention centers. Make a reservation today at the Best Western Plus Executive Inn. Our staff speaks Mandarin, Cantonese, Tagalog and Spanish. We welcome guests from around the world! �From: LA International Airport. Take Freeway 105 East to Freeway 605 North then to Freeway 60 East and exit on Nogales Street. Take the Nogales Exit north for one block then make a left turn on Gale Avenue to the Best Western Plus Executive Inn. �From: Ontario Airport. Take Freeway 60 West and exit on Nogales Street or, take Freeway 10 West to Freeway 57 South to Freeway 60 West and exit on Nogales Street. Take the Nogales Exit North for one block then make a left turn on Gale Avenue to the Best Western Plus Executive Inn. Shopping - Local shuttle to businesses and shopping mall within three miles of hotel. 3 mile(s) from Sceptre Inc.
~23 miles from Rowland Heights.